This species is accepted, and its native range is Borneo (Sarawak, Brunei). Known from Andulau and Bukit Biang and from the Lambir Hills National Park in Sarawak. Endemic to Borneo. Slender clustering rattan climbing to 3 m; stem without sheaths 4-5 mm diam., with sheaths 8-10 mm diam., internodes c. 8-12 cm long. Sheaths dull dark green, drying brown, armed with scattered and partially whorled short triangular spines to 4 mm interspersed with very fine close, minutely spiny ridges encircling the sheath, grey indumentum abundant between the ridges; knee present but rather poorly developed; ocrea short, tattering, minutely ridged. Flagellum to 1 m or more. 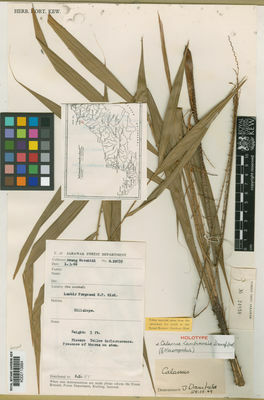 Leaf ecirrate, to c. 75 cm including the petiole to 13 cm; petiole armed with scattered reflexed and horizontal spines and a few ridges near the base; leaflets 9-13 on each side of the rachis, rather distant but ± regularly arranged, the longest to c. 25 × 1.5 cm, the shortest at the leaf tip c. 14 × 1.2 cm, rather narrow, gradually narrowed to a long slender tip, minutely bristly on the lower surface. Inflorescences flagellate, to c. 2 m, with about 3 very distant partial inflorescences; prophyll very tightly sheathing, elongate, armed with short prickles and ridges; partial inflorescences to c. 30 cm long, very lax and slender, bearing distant rachillae, the male to c. 3 cm, the female to c. 5 cm, each with distant large flowers borne on large flower cushions. Mature fruit ± top-shaped, c. 7 mm diam., conspicuously beaked, and covered in c. 15 vertical rows of chestnut brown scales. Seed c. 5 mm diam., rounded; endosperm homogeneous. Seedling leaf bifid. (Fig. 65).